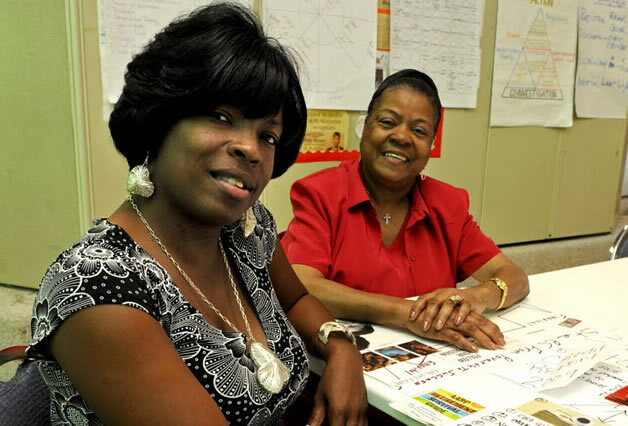 Bridget Brown, left, and her mother, Ruthie Dickerson, took an eight-week personal finance course offered by the HOPE Ministries in Baton Rouge. The program teaches financial literacy and better decision-making. Bridget Brown knows what she wants the master bedroom and modernized kitchen in her new house to look like, though she has yet to see it in real life. And she’s decided on her “Sunday car,” a 2009 silver Mercedes convertible. Brown, a single mom who earns about $25,000 a year, said she used a financial and life management class offered by HOPE Ministries to change her spending behavior, set goals and get out of poverty. Nonprofit groups typically thought of as providing food and shelter are reaching out more to residents who want to become financially secure and move toward a goal like buying a home. Though Brown still has to pay off creditors and save the money needed to fulfill her dreams, she said at least she now realizes that she was wasting a lot of time and money in the past. “I was just living in the moment, and I wasn’t worried about that,” she said. HOPE Ministries’ “Getting Ahead in a Just-Gettin’-By World” class promises to teach not just the fundamentals of prioritizing and budgeting but also how to make social connections that help people climb up the economic ladder. Richard Stonich, a retired banker, teaches the 40-hour class. He said when the Baton Rouge nonprofit was discussing the program about three years ago, they asked him to review it and critique it. “I looked at it and said, ‘This is the missing link,’ ” he said. The Getting Ahead program is not so much about financial literacy but what behaviors people have that continue to affect their finances, he said. “You can give people money to get back on solid financial footing, but if you don’t teach them how to make better decisions … then what good is that money?” said HOPE Ministries executive director Renee Craft. Getting Ahead participants have to create plans for their future that touched on the 11 resources “everyone needs in order to live well,” such as emotional, physical and motivational. The program also discusses “hidden rules,” a term coined by poverty expert Ruby Payne to describe the unspoken behaviors and beliefs within economic classes. For example, families in poverty usually believe that they cannot do much to change what happens to them, according to the Getting Ahead book. Middle-income families, on the other hand, believe they can change the future with good choices now. By understanding the differences, people in poverty are better able to break their “rules” and create relationships with people who can help them move forward, said Phil Devol, author of the Getting Ahead program. Participants of Catholic Charities’ first-time homebuyers class also come to difficult realizations. Morlyn McClain of Baton Rouge said she was surprised to see her credit report for the first time. It showed debts that were not hers, from different people with similar names or addresses, tacked on to her report, she said. It also pulled up a bounced check from years past, she said. “Something as simple as that can prevent you from getting a home,” she said. Without the homebuyers class, McClain said she probably wouldn’t have known how to read her credit report, or spot a credible financier, or ask for what she needs in a loan, not what other people want to offer her. “They really put me on the right track and put me in touch with the right resources,” McClain said. Catholic Charities offers grants to homebuyers who were affected by Hurricane Katrina in 2005. Other agencies offer assistance based on income or assist with Individual Development Accounts, which provides a financial incentive to people who save money for specific investments, like a house. The program run by the Catholic Charities of the Diocese of Baton Rouge is now being expanded to Livingston and Tangipahoa parishes, said Diane Pitts, coordinator for the organization’s family achievement center. “We feel that education will empower people,” Pitts said. Original story is at http://www.2theadvocate.com/news/57620627.html?showAll=y&c=y, but they don’t always keep it available online.